BrandBucket sent out their September newsletter, and while I know some readers believe if you don’t get the actual names that sold it’s worthless, I respectfully disagree. I would like the names too but I do believe any data you can attain has some value attached to it and is worth the read. When you take out sales over $10,000 the average sale was $2,887, so all those dreaming about six figure paydays from their brandable names might need to lower expectations. Keyword sales continue to lead invented keywords at a 60% to 40% rate. Domains were flying off the virtual shelves at BrandBucket last month. From July, we saw a 30% increase in total sales. Removing sales about $10k, our average sale amount was $2,887! Since we ended discounting, we have a seen a positive response from buyers. For those buyers who requested a discount and did not receive one, the closeout rate was over 75%! This supports BrandBucket’s messaging of transparent pricing and will allow you the sellers to get the highest take home amount possible. 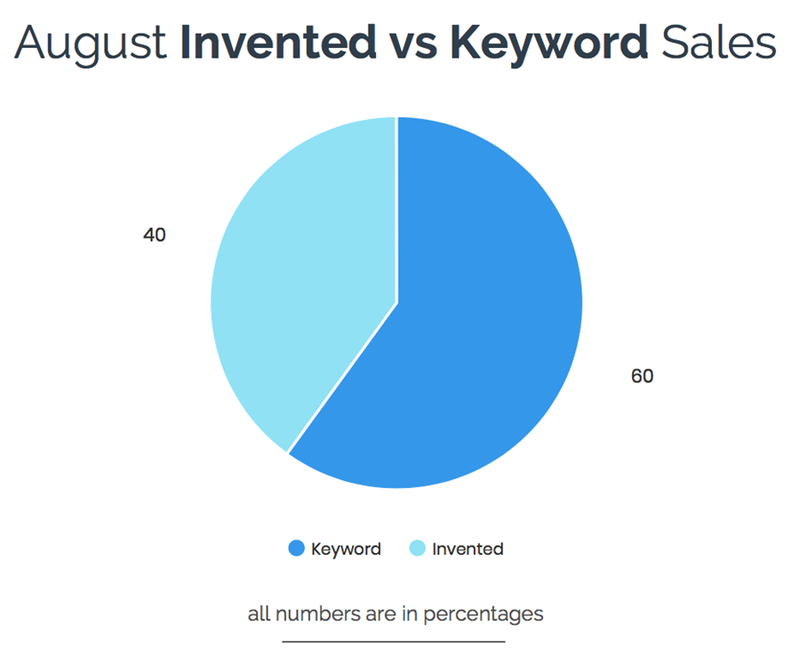 Keyword: The month of August had a slight change in keyword sales compared to July. The order of most popular is still the same from the previous month with Two Word Keywords taking the greatest chunk of sales. The biggest difference from July to August was the slight drop in One Word Keyword from 9% to 2%, this was the same for Misspellings the dropped from 11% to 3%. 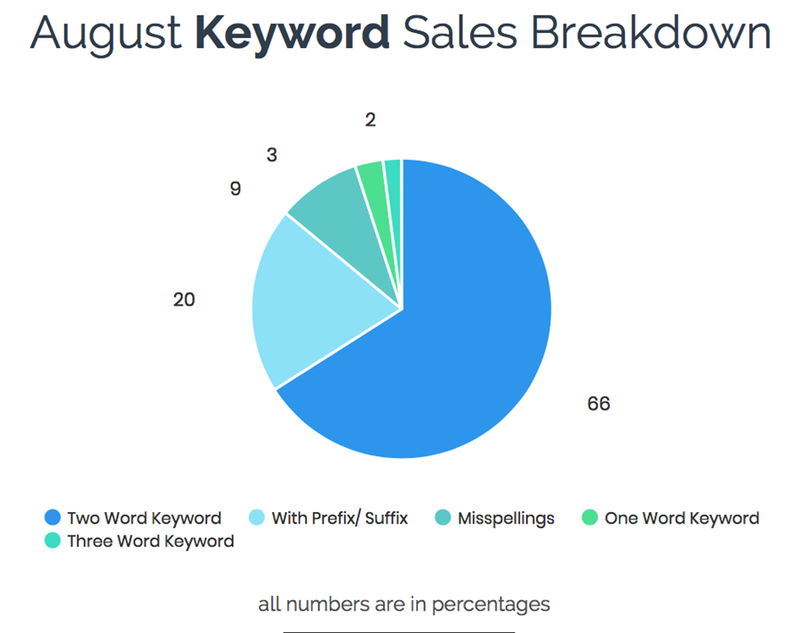 Two Word Keywords and With Prefix/Suffix went up in the month of August. We has sales of short phrases as well this month which fell under the Three Word Keyword category. Overall, a great month in sales! 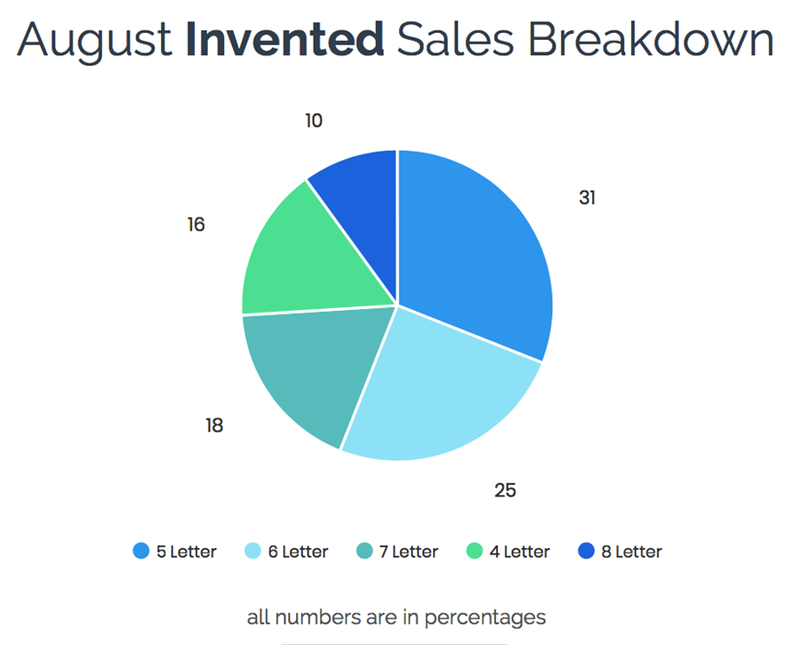 Invented: In August, the highest selling Invented category went to 5 Letter names compared to 6 Letter words being the top in July. The only other change for Invented names was 4 Letter names sold more then 8 Letter names which the opposite occurred in July. 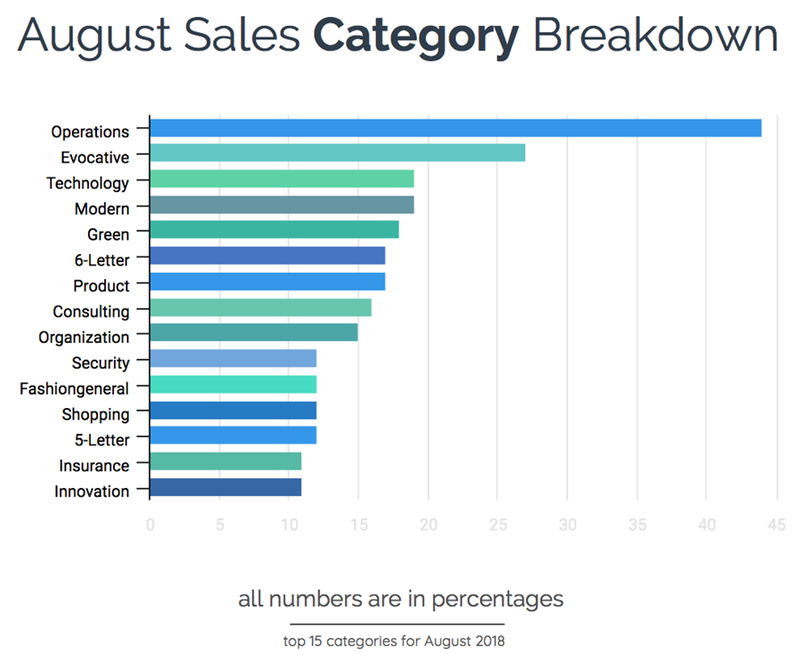 Categories: From July to August, the categories for the names that sold changed slightly. The top three for both months were still Operations, Evocative & Technology. But in August, Modern & Green pushed July’s 4th top category to the 6th slot. Consulting, Organization, Security and 5-Letter still remain strong over the last couple of months. Invented vs Keyword: Compared to July, we only saw a 1% change. July was 61% to 39% while August was 60% to 40%. We will have to see what September brings!